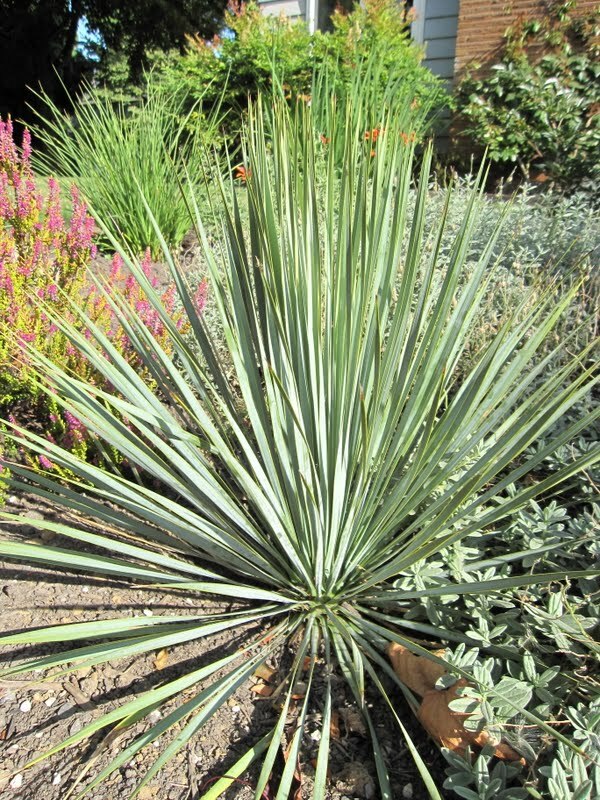 Yucca rostrata, planted this spring, is thriving in our summer sun. I hope I've given it enough drainage to survive our wet winter. 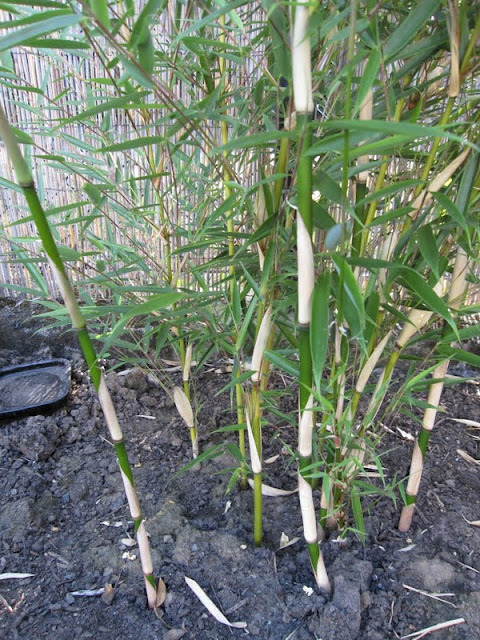 I'm so relieved that lovely white sheaths on the new culms of Fargesia robusta bamboo are conclusive evidence it's not a return of the running Phyllostachys we evicted from the garden. It's a treat to see this new growth in mid-summer: apparently most Fargesia only shoot in spring. 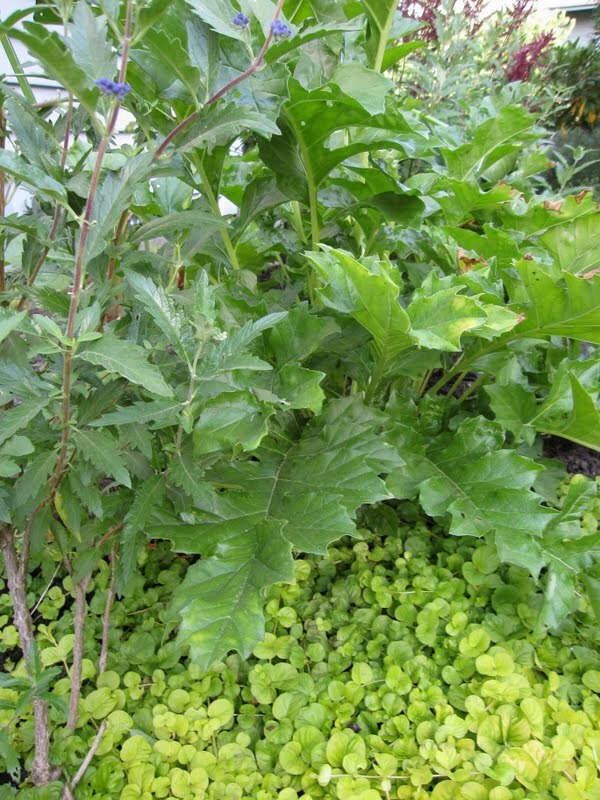 Lysimachia nummilaria 'Aurea' underpins a slow-growing Acanthus. One of these years I may even get blooms! The color of my Eucalyptus leaves is the perfect gray-green. 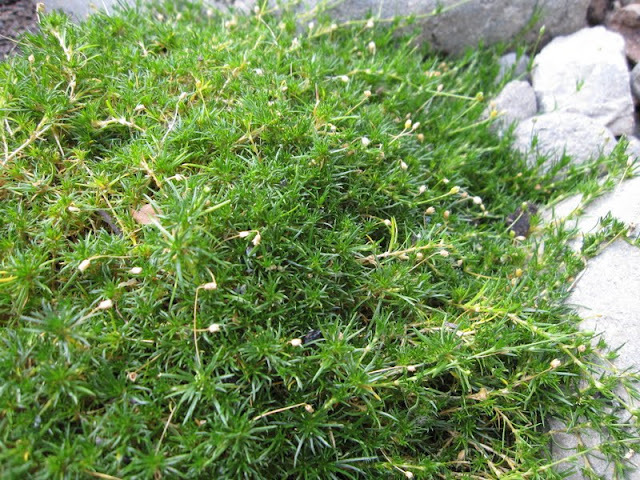 Irish moss is gradually re-establishing itself after spring's garden upheaval. A passalong Persicaria with its distinct chevron. My new Tetrapanax 'Steroidal Giant' is looking good and has BIG leaves. 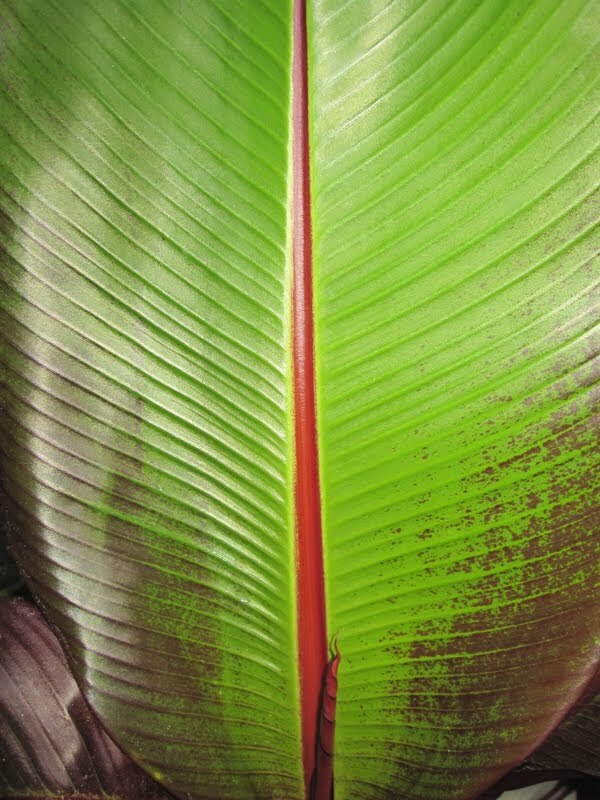 Finally, a decidedly non-zone-8 plant: But Ensete maurellii has the most delicious color on its glossy gorgeous leaves. Summer is at its peak in Portland. 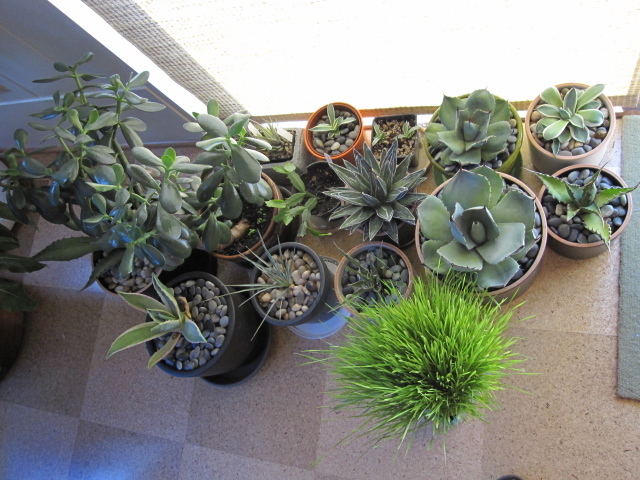 We've had day after day of sun and warm weather, just perfect for all my heat-loving plants. Rather than move around the perimeter of the house as I usually do to show you what's blooming, today I decided to arrange my August blossoms by color, starting with red. Helenium 'Moerheim Beauty' is past its prime, but a few new blossoms continue to open. My inexpensive little Abutilon hybrid 'Tangerine' is covered with blooms. In contrast, Clivia minata 'Belgian Hybrid Orange' has a restrained (but fabulous) four whole blooms. I'd grow Clivia for its gorgeous glossy foliage even if it didn't bloom. 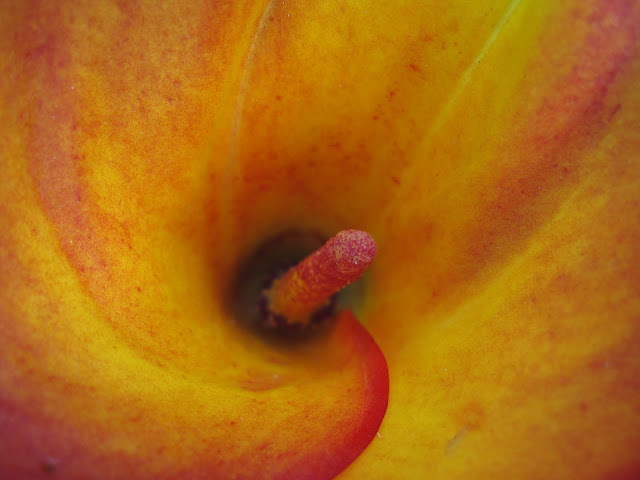 I want to dive into the center of Zantedeschia 'Flame'. Magenta is covered by Cistus 'Sunset'. 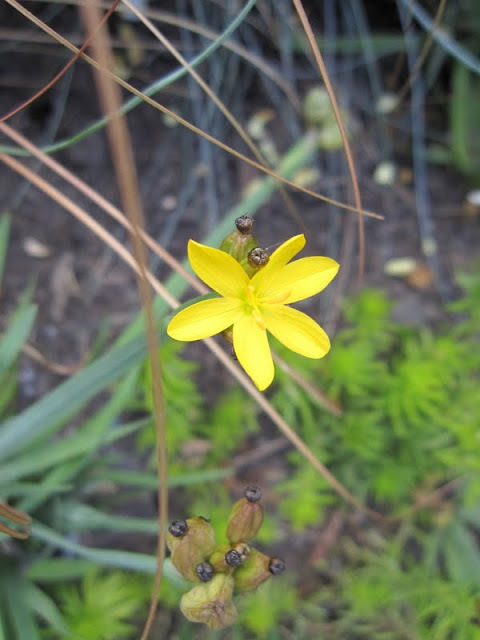 And a tiny Sisyrinchium californicum. 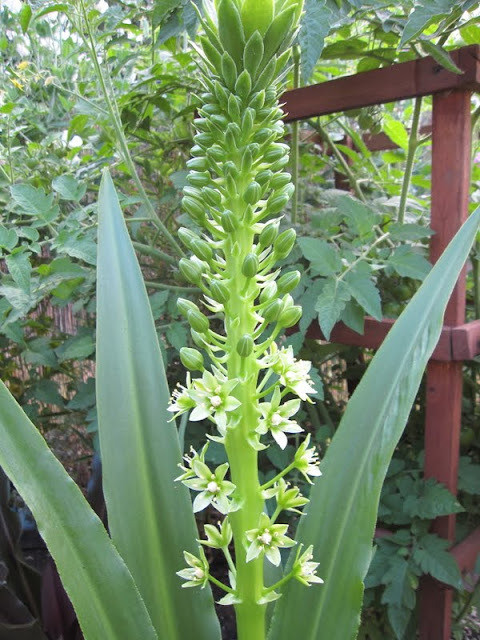 My first blooming pineapple lily, Eucomis pallidiflora ssp pole-evansii, moves us into green. 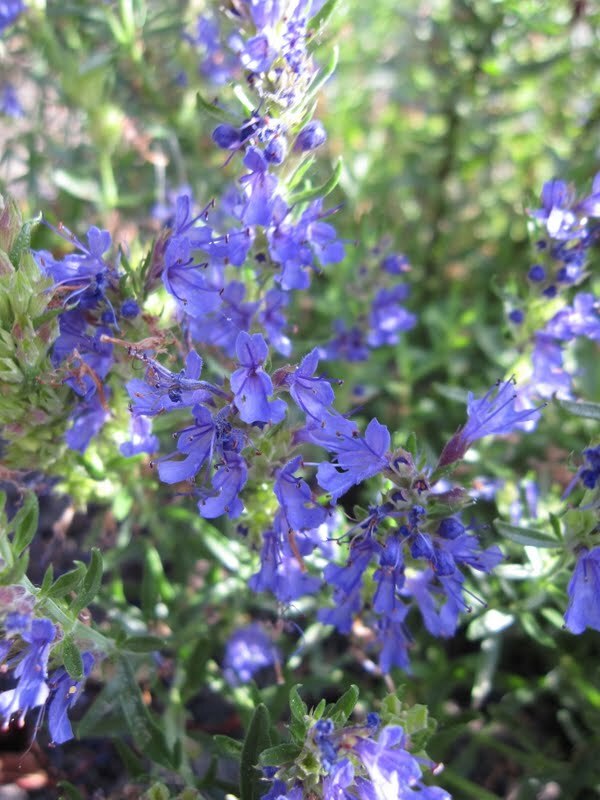 Hyssopus officinalis 'Dwarf Blue', new this year, and filling in nicely. 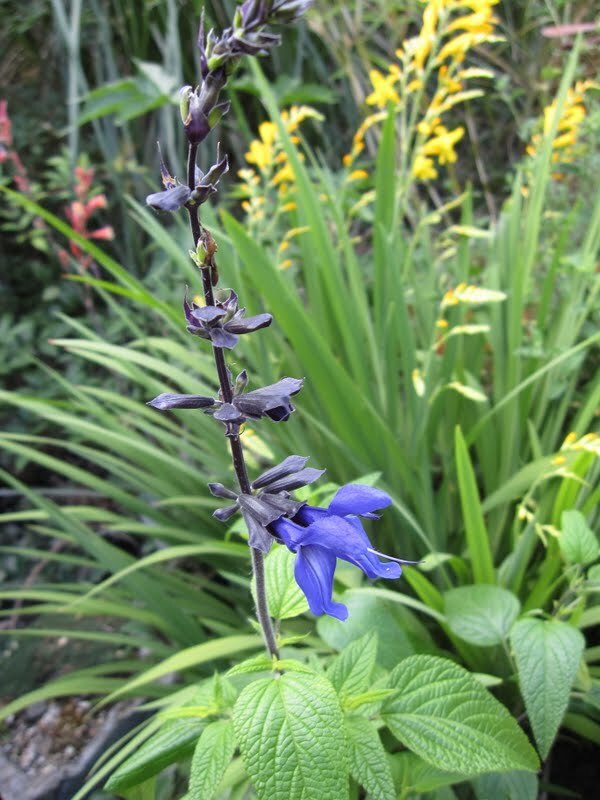 And an Asian eggplant flower is straight ahead purple. I shot this photo upside down, so the sky is illuminating the flower from above. 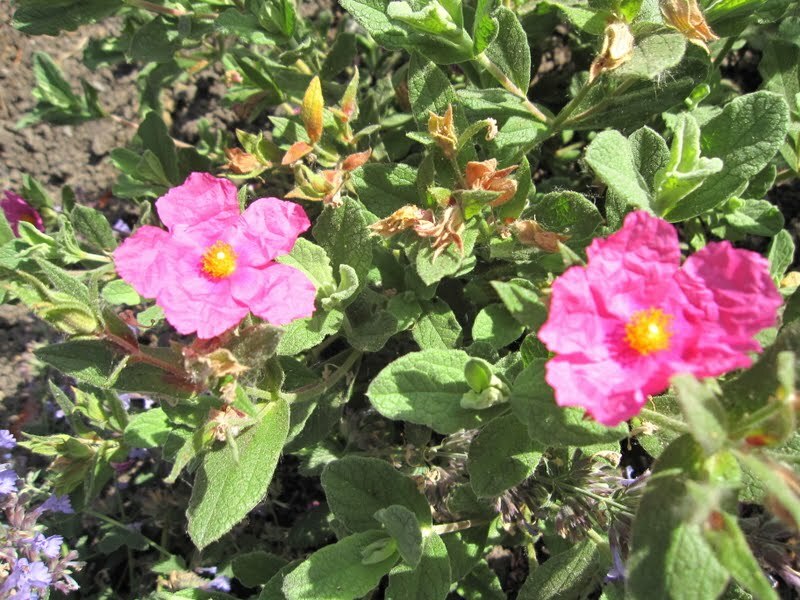 Bloom Day is hosted by Carol of May Dreams Gardens. 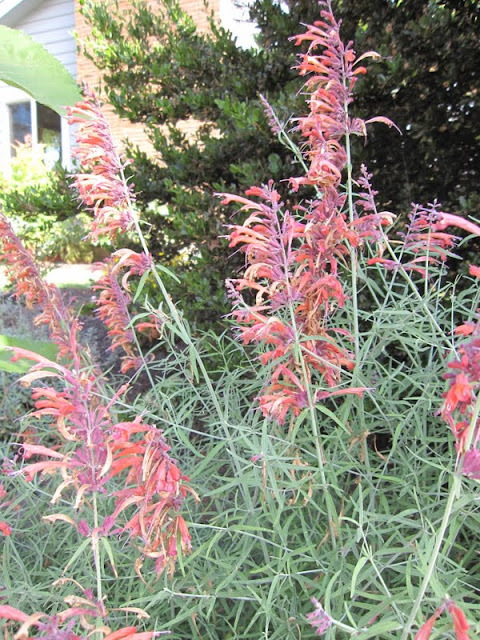 Click over to take a look at what's in bloom elsewhere across the nation and around the world today. Saturday and Sunday, I spent hours carefully and laboriously moving everything not secured in the ground (plants, pots, outdoor furniture, doormats, etc.) from around the house. Plants that can tolerate a few days of added sun got moved to the perimeter of the garden. Meliathus major looks a bit surprised to find Agave bracteosa and A. filifera cozied up next to it, with a Yellow Flax tucked in behind. 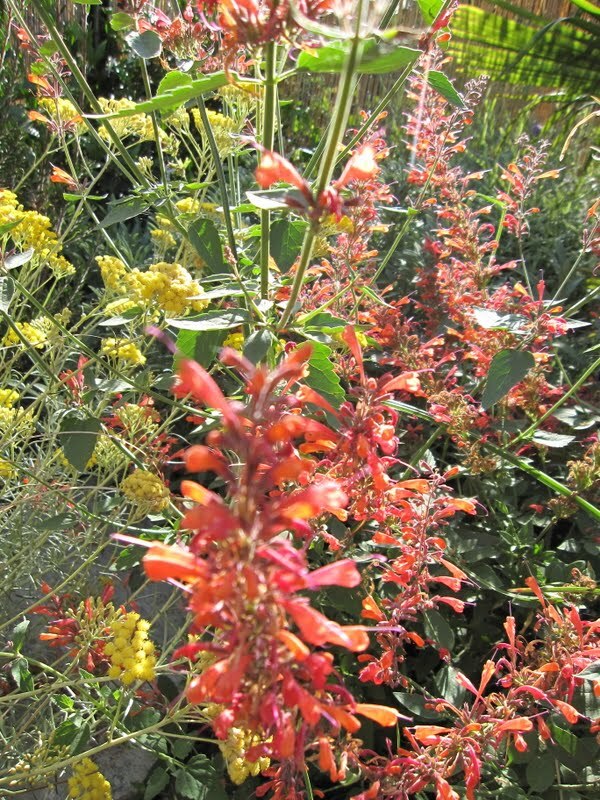 A. geminiflora shields a mixed flat of small pots that I still haven't planted due to our summer of construction. Patio and deck chairs are banished to the furthest edges of the grass. Smaller agaves have moved inside the sliding door in a semblance of their winter mode. A few plants that need more shade than we can provide outdoors are out of harm's way in the garage for a few days. It looks suddenly lush in that utilitarian space. The new patio is empty, except for the scaffold to install the skylights. The front porch is naked. See the lovely aqua paint test on the left side of the picture above? Sadly, it's one more color we won't be painting our house. While I think it strikes the perfect retro note and looks great with the brick and our foliage, the Mulchman is needing something a bit earthier. He'd be fine with Burma Jade, but I think it's too green to work well with the foliage around the house. So after twelve (yes, twelve!) paint mixes, we have yet to reach agreement on a color. You would just think two design professionals would have an easier time deciding, right? Meanwhile, this morning I'm sitting at my computer listening to loud scraping and falling sounds emanating from my roof. The windows and planting beds next to the house are draped in blue tarps, giving our interior a weird underwater quality. But the new roof will be done tomorrow!